Is your front or back yard in the dark? 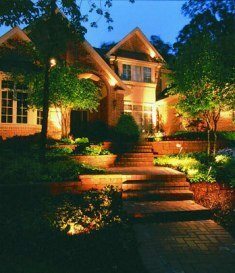 Landscape lighting is not only functional, but can make a dramatic difference in the visual appeal of your home. That said, try and consider both of these elements when designing your lighting plan. Miss the Runway ~ If you’re lighting a walkway or driveway, try and add some uniqueness to the layout. Though lights perfectly lined up along your walkway seem like the natural thing to do, it can appear more like an airport runway than an entrance into your home. Stagger the lights for a more natural effect. Give the Light Some Shade ~ Think about positioning the lights in such a way that plants will be gently tucked around them. This will soften the glare, but still expose enough light for function. As you see in this photo, there’s plenty of light to illuminate the space, but several fixtures are hidden to where you don’t even see them. Reduce the Glare ~ Though bright lighting is functional for guiding the way and security purposes, it can be offensive if it’s glaring at your guests upon arrival. The purpose of landscape lighting is to add beauty to your home, and create enough lighting for you and your guests to safely move throughout the space. Of course, there are exceptional times when you may need brighter light for tasks, or if you have people with special needs. For these instances, you can still have the light available, but installed on a switch that’s separate from your main landscape lighting. Check back every Friday for more decorating and home improvement tips. If I can give you any assistance with your design or decorating needs, please don’t hesitate to call or email me. Many times a single consultation is all that’s needed to pull your ideas together!